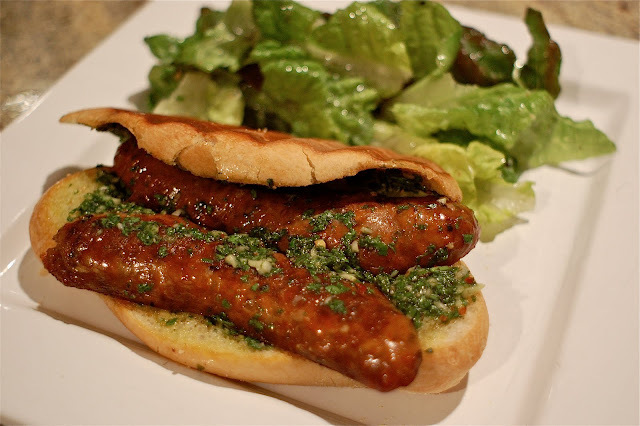 Our delicious chorizo sausage is split lengthwise, char-grilled, topped with a large dollop of chimichurri sauce, and served on a crusty roll. Our homemade chimichurri sauce is made from finely chopped parsley, minced garlic, olive oil, oregano, vinegar, and a heavenly mixture of secret spices. As the legend goes, an Irishman named Jimmy McCurry, fighting alongside the Argentine independence movement in the early 1800's, is credited with introducing this sauce to the native population. Eventually the name became corrupted, and Jimmy McCurry sauce became chimichurri sauce.